The leotard has a very long history, with its origins dating back to the late 17th Century. Since then, it has been used by acrobats, dancers, gymnasts, and has even worked its way into everyday fashions. The word "leotard" commemorates the famous French trapeze artist Jules Léotard, who wore the garment when he was performing. Jules Léotard was born in 1842 and died in 1870. 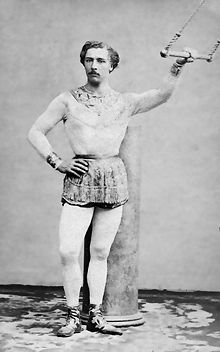 During his short life, Léotard impressed audiences with his trapeze stunts and was the inspiration for the 1867 song "The Daring Young Man on the Flying Trapeze." He called his outfit a "maillot," which means tight fitting garment. It wasn't until 1886, years after his death, that similar outfits became known as leotards. Though the leotard as we now know it was popularized by the Jules Leotard, it is suggested that the leotard's true origins lie a century earlier when body stockings were favored undergarments for the popular Roman gowns of the time. In the early 1900's leotards were used by acrobats and circus performers. Gymnasts at the time wore dresses because modesty was important. In the 1920's and 1930's leotards looked much like they do today and even began to influence the design of bathing suits. By this time, professional dancers and gymnasts were also using leotards more widely. The time period allowed for more expression and women were more free to show skin. Both showgirls on Broadway and burlesque performers in Europe were seen in leotards during this time period. More and more gymnasts also began to realize that these leotards allowed for much greater freedom of movement. Because of this, the sport itself began to develop. Around this time, all four events performed today - the floor exercise, the uneven bars, the balance beam and the vault - were introduced to the sport and the skill difficulty increased immensely. Finally, gymnastics was being seen as a more serious sport. From the 1950s to the 1970s, leotards remained very simple and very rarely incorporated the use of more than one color. In the 1960's major fashion designers such as Pierre Cardin and Rudi Gernreich began making lingerie based on the designs of leotards. The 1970's saw a major advance in both form and function due to an advancement in textiles. The leotard's fabrics were now far more colorful, which was largely a reflection of the fashions of the time. Nylon and spandex allowed for more form fitting leotards and improved aerodynamics. Today's leotards are extremely decorative and include various types of embellishments. They come in an array of colors and and cuts. The extremely difficult skills that gymnasts are now able to perform, are thanks in part to the advancements in leotard manufacturing. Though leotards have come a long way since Jules Leotard first used it during an acrobatics routine, the basic cut of the leotard has remained the same. This is because it has proved to be very successful as a functional piece of athletic wear. Because of this, it is likely that we will continue to see gymnasts in leotards for many years to come.